Mantis shrimp use a variety of visual signals in order to communicate with one another. One set of commonly used signaling structures are the antennal scales; flattened, paddle-like structures derived from the second antennae and set on either side of the mantis shrimp’s head. They have a wide range of motion and can be directed at other mantis shrimp as part of intraspecific threat and mating displays. The antennal scales are often adorned with attention grabbing color and polarization patterns that stand out to other visually adept mantis shrimp. However, the deep ocean is not kind to color contrast. As you move deeper, the absorptive and refractive properties of water attenuate the spectrum of available light. 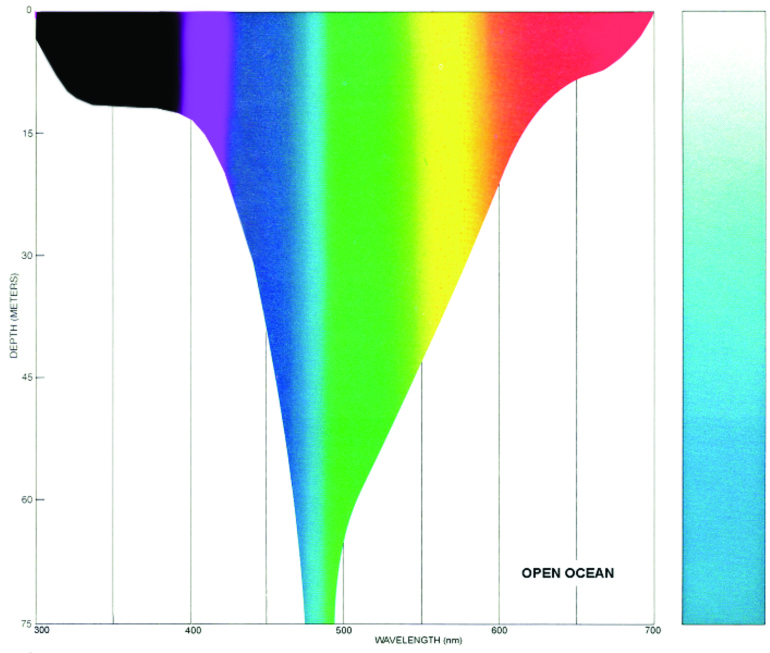 Longer and shorter wavelengths are filtered out until eventually the only available light is blue-green, around 480 nanometers in wavelength (left). 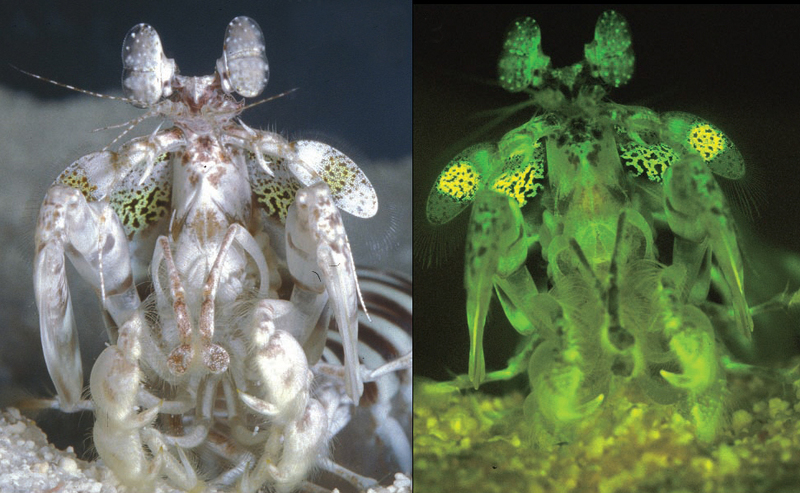 Despite this limitation, some deep water mantis shrimp have found a way to preserve their color signals in an essentially monochromatic environment. Lysiosquillina glabriuscula has bright yellow spots on its antennal scales and the underside of its carapace. 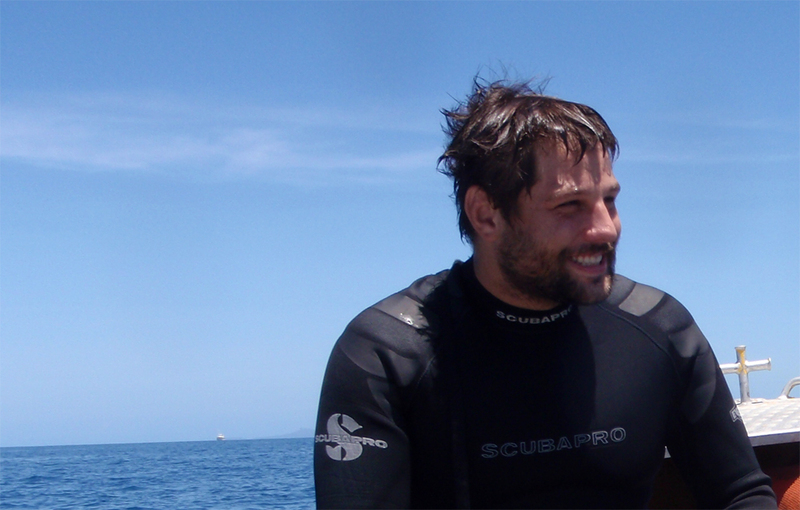 This species is found in the shallows as well as at greater depths. It turns out that the yellow spots contain fluorescent materials that are stimulated by blue light and emit yellow light, similar to the yellow reflected light that the spots produce in white lighting. Therefore, these mantis shrimp are able to preserve their yellow spot signals at depths where there is only blue light available.